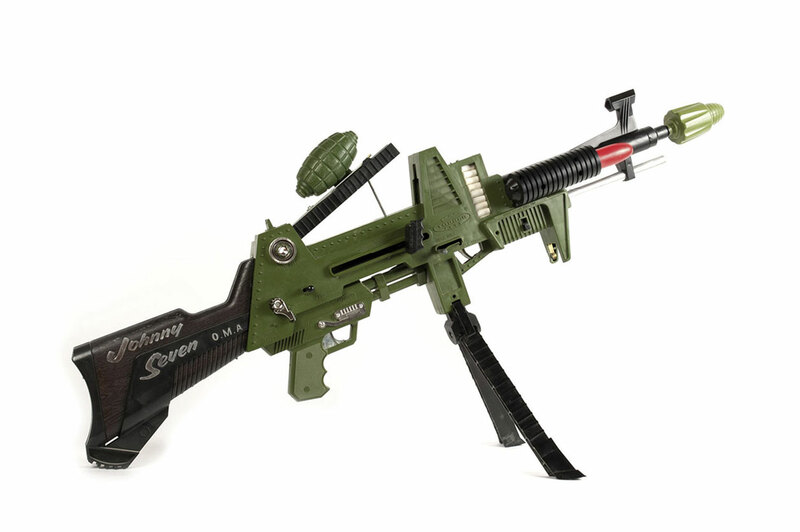 It’s an unwritten law that any nostalgia kick from a boy growing up in the ‘60s and ‘70s has to include his unrequited ambition to own a Johnny Seven gun, that multi-purpose piece of juvenile military hardware lauded by Jonathan Ross and, in truth, well out of Christmas wish list range for most of us as we studied the Kays catalogue with wistful eyes. And, yes, I would have liked one, but actually was far happier with my Airfix FN Rifle, that scaled-down version of the SLR replacing the Lee Enfield .303 as the standard issue weapon of the British Army. However, I’m wandering from where I meant this to go (sorry, it’s the opportunity to mention Airfix – gets me off track every time). I’m currently dipping occasionally into the superb TV Cream Toys, an offshoot publication from the encyclopaedic TV Cream website, listing all those toys of the ‘60s, ‘70s and ‘80s that leapt from the TV screen onto our Christmas lists. Lots of likely candidates in there, a good few of which did enter our household and stay there thanks to the good judgement of Mum and Dad, but page after page of desirable toyware sparked memories of a few items that forever eluded me and seem likewise to have escaped the TV Cream pages. 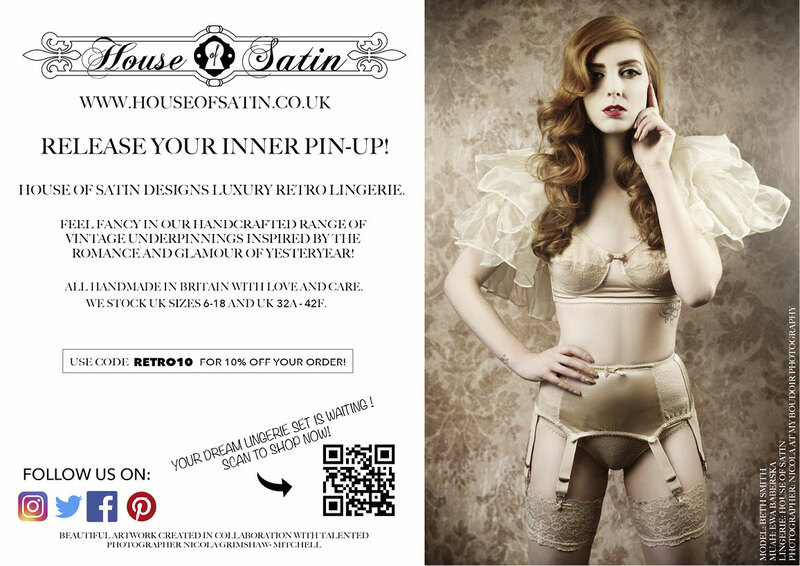 So here goes, and if anyone fancies making a belated Xmas present of them at Mid Century Villas, there’s still plenty of time left! A trip down the road to my friend Tony’s house offered two attractive novelties. The first was colour TV, something of a luxury in the early 70s, and good reason to press noses against the screen to pick out the thousands of coloured pixels – magic in itself. But the real lure was in his collection of Major Matt Mason toys. 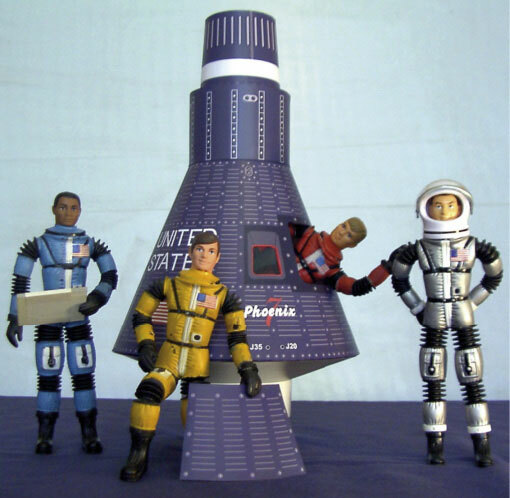 A Mattel product, this space era action figure was significantly smaller than the Action Man who took up much of our time, but exuded 60s space era optimism. 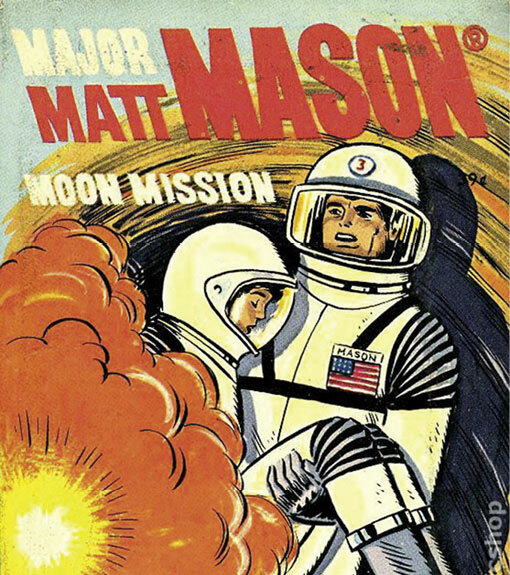 What’s more, unlike Action Man, his joints stayed firmly hidden under his rubberised space suit, giving him an altogether more realistic appearance and the ability to stand in poses that were less reminiscent of an advanced arthritis sufferer. 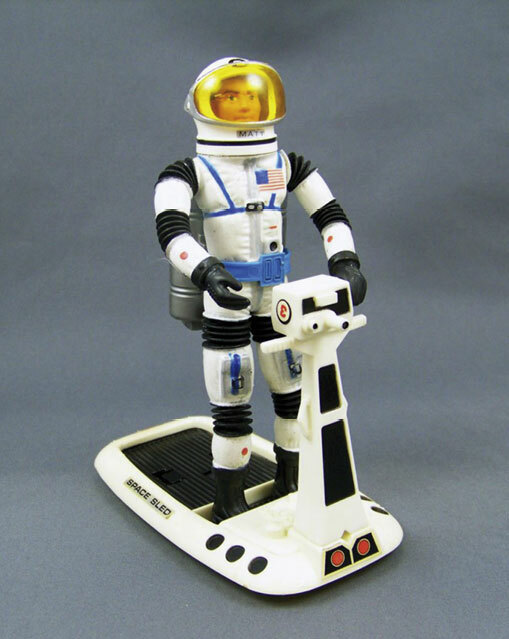 Major Matt Mason action figure with ‘space sled’. I’m not sure if Tony’s Major Mason had any of the colleagues that were available – maybe his was a solo mission – but he certainly had a good selection of the equipment that came in the range. Again, unlike Action Man, and thanks to his smaller and lighter frame, everything seemed to work better, particularly the jet pack which contained a kind of in-built zipwire allowing him to zoom weightlessly across the living room. Sadly, the Mason universe never made it up to our end of the road, and the closest I came was the linked Big Little Book. Major Matt Mason with the crew of the Phoenix 7 space module. I suspect now the rubber in the intrepid Major’s space suit has long perished, exposing his armature to the ravages of the infinite, but I’d still like one. The second gap in my toy cupboard isn’t really a toy at all, so excusably doesn’t feature in TV Cream, but certainly qualifies as something I’d happily have taken round to my pal Thomas’ house, and that’s anything related to Bazooka Joe chewing gum. Each piece came wrapped in its own miniature comic strip, which (so Wikipedia informs me) would at that time have been a mixture of the original Wesley Morse strips that ran from 1953 to 1967, and the later ones by Jay Lynch (and I’ve just spotted that there’s a collection of the strips available in book form, which is going to do nothing for my resolution to cut down on book buying after a recent splurge!). 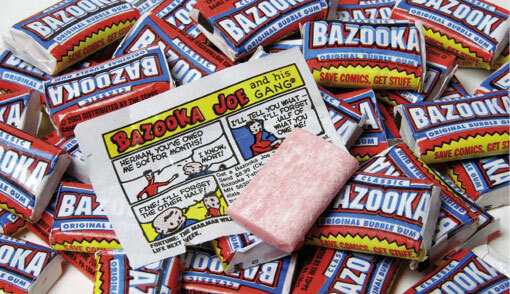 Bazooka Joe chewing gum and mini comic. I’ve also got a distant memory of a bunch of related merchandise, but I think that’s a connection with the American comic books that Tom’s dad would bring back from the States for him and in which we pored over the goods that those lucky American kids could buy by sending off just a few dollars. How immensely more exotic than the ‘Miscellaneous’ pages of my Dad’s Exchange and Mart! It seems the Bazooka Joe comics finally bit (chewed?) 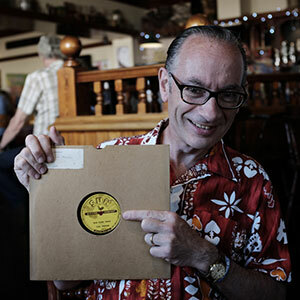 the dust in 2011 when they were replaced by brain teasers. Sadly, I’d given up on them years ago after failing ever to blow anything even faintly resembling a bubble, managing only ever to spit the intact and well chewed gob of sticky gum onto the nearest and inevitably fluffy carpet. And finally, a toy I yearned for but which finally came to me thanks to my half century birthday weekend trip to Brighton’s North Laine antique shops courtesy of Mrs M. At some point, I shall gear myself up to try to capture my love affair with the work of Gerry Anderson, and particularly the Thunderbirds TV series that defined my childhood. 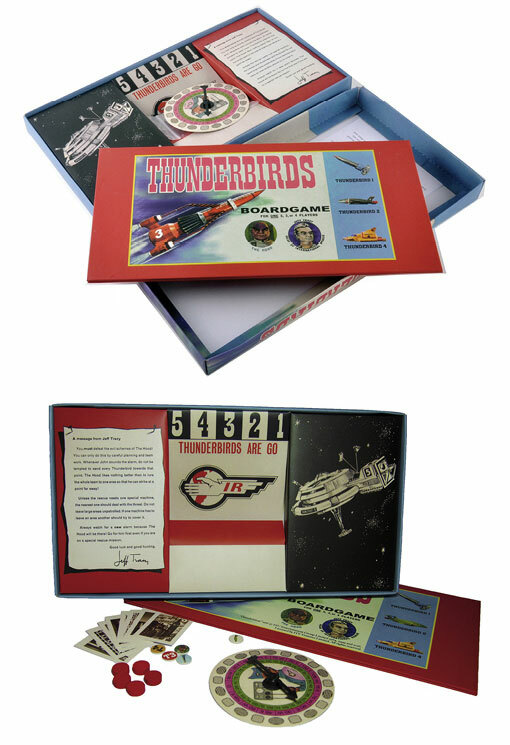 Of course, I had my share of Thunderbirds toys – and not just the Dinky toys that usually feature highly in the collectables listings – but only a visit to Neil Humphries’ house would allow me to play with his Thunderbirds board game. I don’t know what it was that enchanted me so much about that game in comparison with everything else Thunderbirds related – it was, after all, another variation on the familiar Snakes and Ladders theme. It must have been those tiny Thunderbirds craft pieces, making their way steadily around the printed board, but just the thought of it transports me to the back garden of his house on a summer afternoon after school on a day when we didn’t have to get ready for Cubs; I can almost taste the orange squash supplied by his mum. Finally owning the game can’t make me eight years old again, but just opening the box reminds me that the Mid Century boy isn’t far below the Chap surface.